Views, rivers, and mountain springs. What better way to spend a few hours. Take a scenic drive up into the foothills of the Sierra Madre mountain range crossing rivers to visit small ranches with great views. After safety instruction and practice, the tour launches from our base heads into beautiful rural Puerto Vallarta. Drive your buggy down jungle paths, splash through river crossings and puddles (seasonal) and emerge onto rural backroads where the traffic mostly consists of cattle and men on horseback. This tour gets you way off the beaten track, a great taste of "Real Mexico". The tour begins near the airport and takes you through seldom-seen residential areas of Puerto Vallarta, then begins to climb into the surrounding hills, winding up and up until reaching a working hacienda, where you we'll have the opportunity to taste a variety of tequilas, and learn how this famed Mexican liquor is made. You can also have a drink, lunch, or just explore a bit. Back in the buggy, the tour returns down the valley. 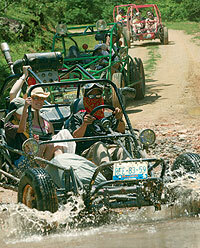 Departs From: Dune buggy tour offices in Puerto Vallarta. This tour meets close to the airport, so convenient for people staying in Marina Vallarta, Southern Nuevo Vallarta and the Hotel Zone. Kids: Drivers must be 18 years old and have a valid drivers license. Riders can be ages 4 and up. Kids are the same price as adults. Notes: Due to it's departure location, this tour involves some city driving. Water features, including puddles and rivers, are seasonal and may not be present at all times, particularly in dry season. Each Buggy can hold up to 2 people. 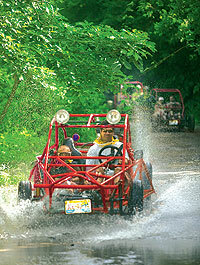 All Dune Buggies in Puerto Vallarta are manual shift.